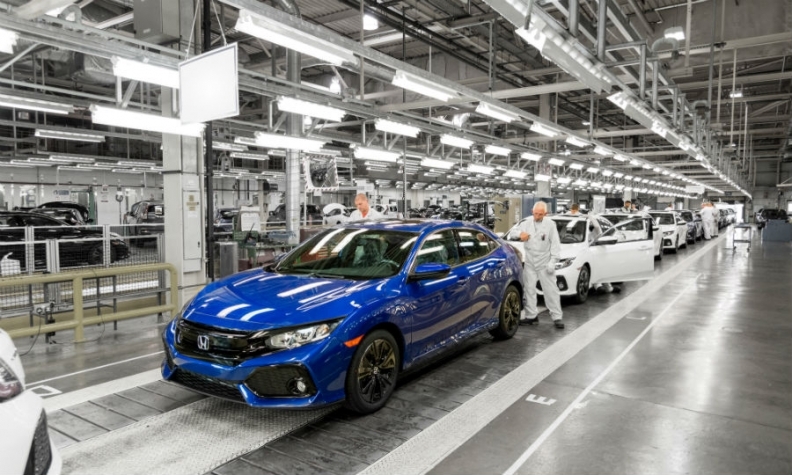 Honda is among automakers with plants in the UK. Its factory in Swindon, near London, is the global manufacturing hub for the Civic hatchback, shown. LONDON -- British car production fell 18.2 percent in April from a year earlier as the number of manufacturing days in the month was reduced by a later Easter break. Car output fell to 122,116 cars but was still up 1 percent in the first four months at its highest level since 2000, the Society of Motor Manufacturers and Traders (SMMT) said on Thursday. "Car production fell significantly in April due to the later Easter bank holiday weekend, which reduced the number of active production days that month, and also due to unplanned production adjustments," SMMT chief executive Mike Hawes said. The Easter break was at the end of March in 2016. There was strike action at BMW's Mini plant in Oxford, central England - which accounts for just over 10 percent of total industry output - on two days in April. The SMMT called on politicians ahead of a national election due on June 8 to support the country's car manufacturing industry during upcoming talks over Britain's departure from the European Union. "We need the next government to safeguard the conditions that have made us globally competitive, keeping us open and trading and delivering an ambitious industrial strategy for our sector," Hawes said. Opinion polls show Prime Minister Theresa May should win the election comfortably. The SMMT said if Brexit talks take longer than the two years set out in EU legislation, the government should push for arrangements which maintain tariff-free and borderless trade with the EU. More than half the cars made in Britain are exported to the European Union. Ford, Britain's biggest automotive engine maker, said earlier this month that a transitional deal is "really critical" for the future of its investments in Britain, which include two plants. Nissan, Jaguar Land Rover, Toyota and Honda are among other automakers with UK factories.